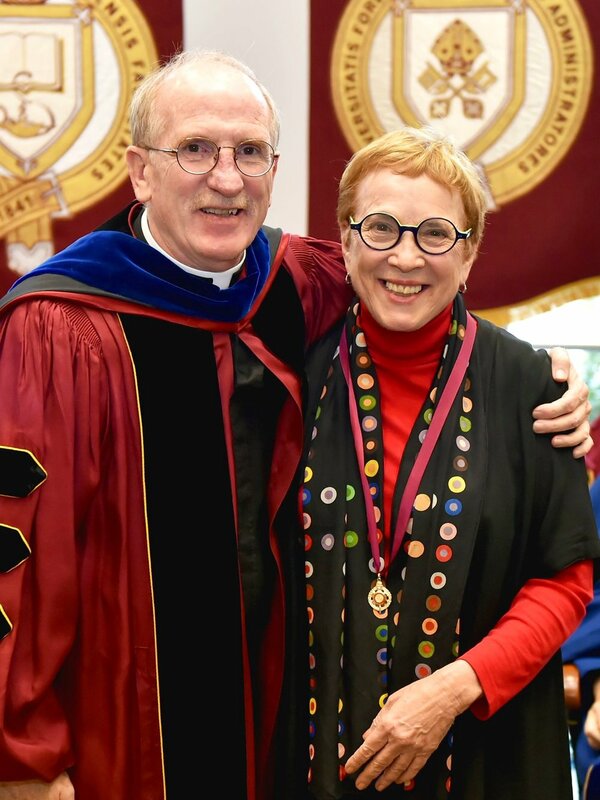 At the annual Convocation ceremony, held this year on March 10th at Lincoln Center, the Fordham community celebrated the considerable contributions of long-serving university professors, administrators, and staff, including the English Department’s own Professor Chase. 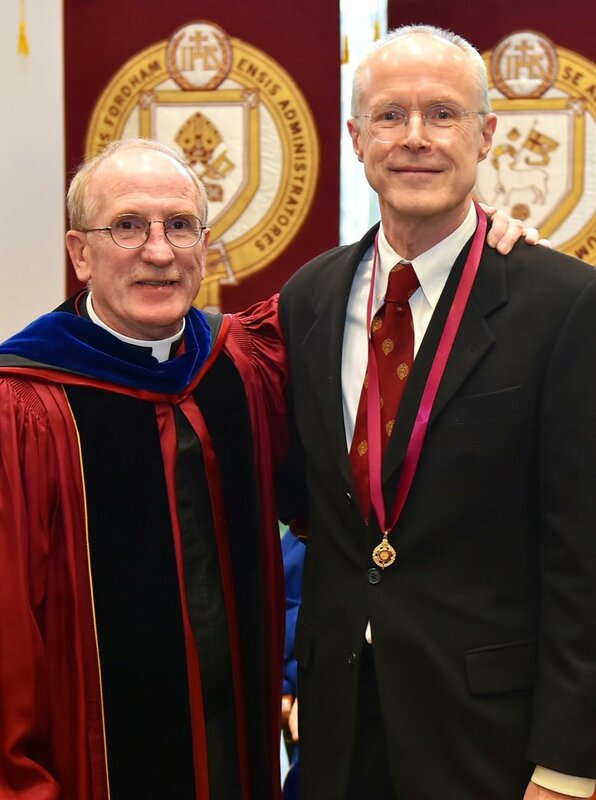 Father McShane thanked Professor Chase for his exceptional scholarship and pedagogy, and awarded Professor Chase the Bene Merenti metal for 20 years of service to Fordham University. “Anyone who knows Martin Chase understands his passion for the English language and literature in all its forms (including Old, Middle, and Modern). He is a leading expert in manuscript paleography and codicology, as well as the study of Anglo-Saxon literature. His groundbreaking research on Old Norse, a cousin to Modern English, is internationally known. 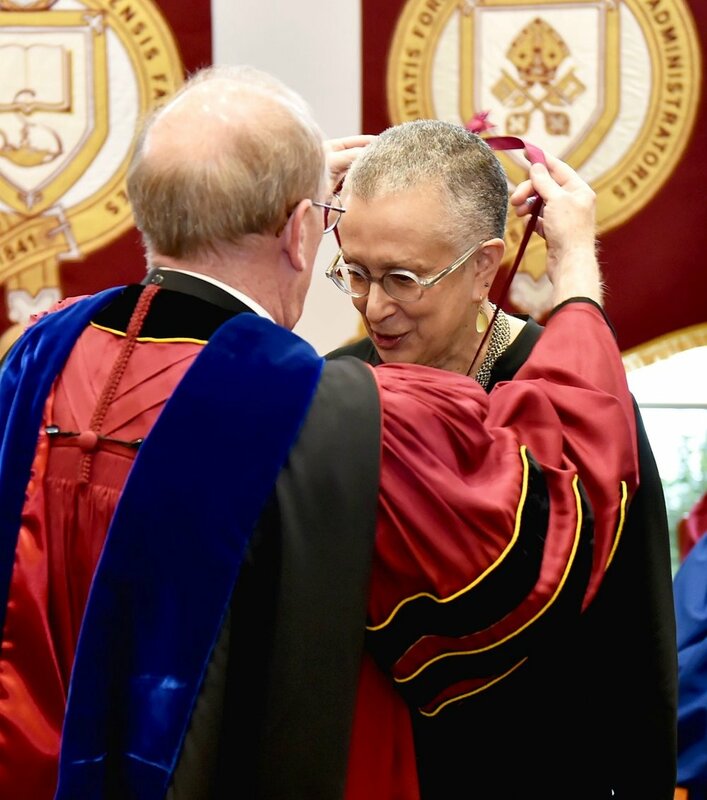 Martin holds degrees from Oberlin College, the University of Michigan, the University of Toronto, the University of Copenhagen, and Weston School of Theology. It was in 1999 that Fordham wooed Martin away from a prestigious teaching post in Copenhagen. He has contributed meaningfully to scholarship on medieval philology and literature, pursuing the enduring question of what makes us human. Along with numerous articles on skaldic poetry and Scandinavian medievalism, Martin’s archival work has yielded editions of Old Norse poetry, such as Einarr Skúlason’s Geisli. Martin’s translations have had enormous impact, giving scholarly access to poems such as the 14th-century Icelandic poem Lilja (or The Lily), which has been referred to as the “Norse Divine Comedy.” Recently, he has edited the collection Eddic, Skaldic, and Beyond: Poetic Variety in Medieval Iceland and Norway. 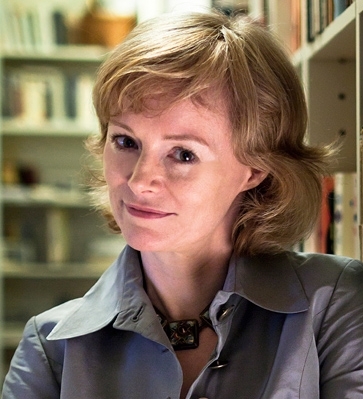 Congratulations to Professor Chase, and thank you for all you do for your students, for the English Department, and for Fordham University. We are now accepting applications for the 2019 Creative Writing Prizes. Submissions will be accepted until February 20th. Click on the titles of prizes to access guidelines and the online submission manager. Congratulations to Mary Bly (pen name Eloisa James), whose novel Too Wilde to Wed has been named one of the ten best books of 2018 by Apple Books. From Apple: “In 2018, Apple Books launched as a brand new app, making it effortless for iPhone and iPad users to discover and enjoy books and audiobooks. This year Apple Books celebrates works from a diverse group of authors,” including There There by Tommy Orange and American Marriage by Tayari Jones. Too Wilde to Wed, a novel Booklist says marries “potent sensuality with a deliciously dry sense of humor,” also debuted at #7 on the New York Times best seller list and was picked as one of Amazon’s Best Books of the Month. 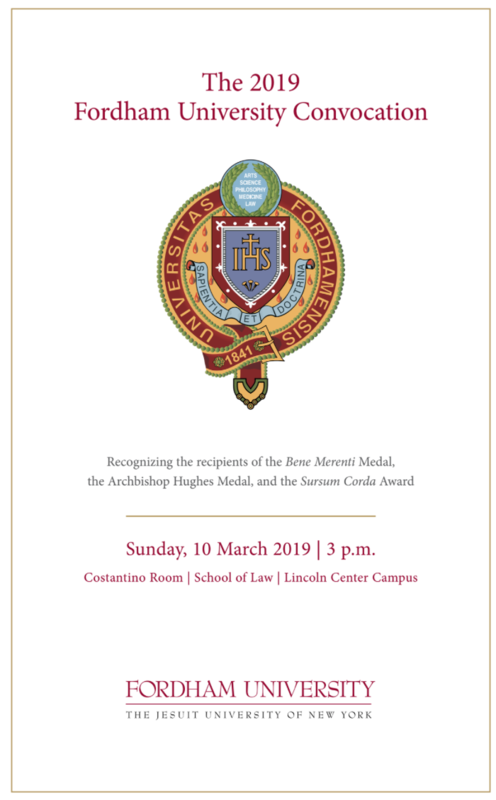 Congrats again to Professor Bly on this fabulous accomplishment. On December 7, the annual Golden Gloves Literary Competition and Fair took place at the Lincoln Center campus. Creative writing classes across Fordham presented their work to compete for three prizes: Ram d’Or (Best in Show), Best Experiment, and the Audience Award. This year, the presentations were judged by Gina Apostol, winner of the PEN Open Book Award for her novel Gun Dealer’s Daughter, and recipient of the Philippine National Book Award. Before the event, attendants enjoyed a pizza dinner and had the opportunity to attend a campus Literary Fair, which featured the publications Bricolage, The Ampersand, The Comma, and MODE Magazine. Staff members in these groups fielded questions from students interested in writing for publication. The competition itself featured ten different creative writing classes: Performance Criticism, Poetry - What Good is It?, Essay is a Verb, The Stuff of Fiction, Poetry of Witness, The Good Life, First Flint, Writing the World, Writing for Teens in an Adult World, and The Outsiders: Reading and Writing Fiction about Outsiders, Outcasts, Exiles, and Rebels. Taylor Shaw, FCRH ‘19, appreciated the diversity of voices and topics represented by the classes. Judge, Gina Apostol read a selection from her new novel, Insurrecto. She was followed by Writer in Residence Nyssa Chow, who presented her multimedia story on a hunger striker in Trinidad, as well as scenes from her Still.Life. Exhibition. As a student in Chow’s Multimedia and Narrative Practice class, Shaw was grateful for the opportunity to hear, see, and be inspired by her professor’s work. The Ram d’Or (Best In Show) award was given to Professor Nyssa Chow’s Essay is a Verb class for their poignant commentary on sexual abuse and feminism after the Kavanaugh trial. Best Experiment went to the students of Professor Sarah Gambito’s The Good Life, for their interpretation of a dialogue with the succulent plants they had nurtured over the course of the semester. Finally, Molly Horan’s class, Writing for Teens in an Adult World, took home the Audience Award for its rollicking tribute to the young adult fiction genre. Though saddened that this would be her last Golden Gloves, senior Evgenia Mantika, FCLC ‘19, expressed her appreciation of how the event brought the creative writing community together.